Delivery to Centurion, Brooklyn & Midrand areas are free with no minimum order. NOTE!! When creating an account, please select "FREE LOCAL DELIVERY" option under the Region tab when entering your address information, in Order to Disable the Delivery Fee. 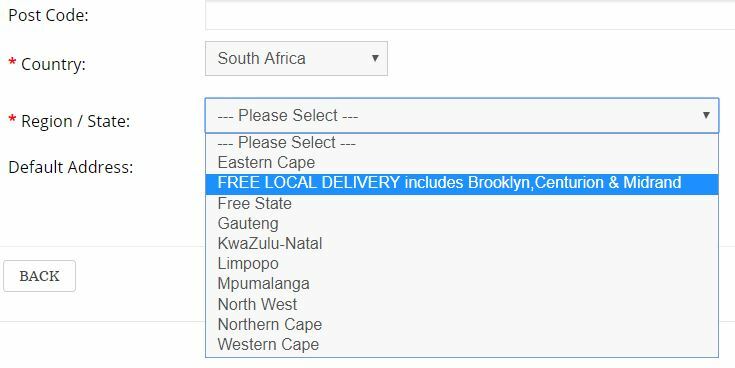 Please see below screenshot for free delivery areas, please do NOT select GAUTENG. A minimum delivery fee of R80 may be charged for other areas. Note this is only a guide and exclusions can be made. Products such as Rubber Stamps, Ink Cartridges usually qualify for Free Delivery in most areas in South Africa. A delivery time frame of 2 days is based on stock items and not items that need to be ordered in. We will keep you posted on your order status.